This delightful modern villa is situated in the Costa Vicentina Natural Park, one mile to the west of the charming fishing village of Burgau at Quinta da Forteleza. Salema is a mile further along the coast. The picturesque and secluded beach of Cabanas Velhas is just a 5 minute walk from the property and hosts the excellent Blue Wave Beach Bar. Also, the exceptional Indian restaurant, Spice Cottage is a 5 minute walk from the house. 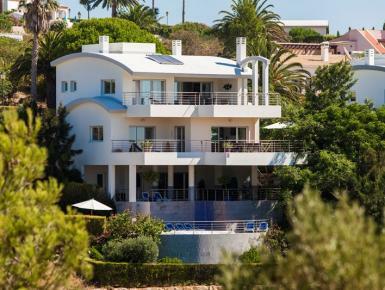 The sun-drenched villa is south facing and enjoys breath-taking sea views. The fully licensed property is set over 6 levels including terraces and garden. The pool can be heated if requested. The villa is ideal for a large family stay or golfing party, with 4 large bedrooms, each with its own en suite bathroom and terrace.